The Blind Men and the Elephant is a parable from India that has been adapted by many religions and published in various stories for adults and children. It is about a group of blind men who attempt to learn what an elephant is, each touching a different part, and disagreeing on their findings. Their collective wisdom leads to the truth. There were once six blind men who stood by the road-side every day, and begged from the people who passed. They had often heard of elephants, but they had never seen one; for, being blind, how could they? It so happened one morning that an elephant was driven down the road where they stood. When they were told that the great beast was before them, they asked the driver to let him stop so that they might see him. Of course they could not see him with their eyes; but they thought that by touching him they could learn just what kind of animal he was. The first one happened to put his hand on the elephant's side. "Well, well!" he said, "now I know all about this beast. He is exactly like a wall." The second felt only of the elephant's tusk. "My brother," he said, "you are mistaken. He is not at all like a wall. He is round and smooth and sharp. He is more like a spear than anything else." 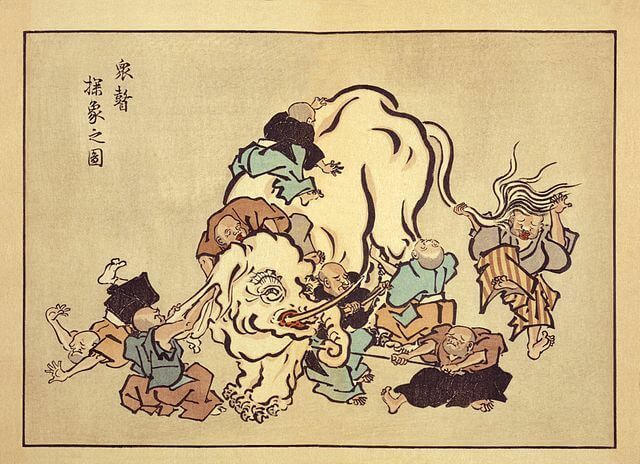 The third happened to take hold of the elephant's trunk. "Both of you are wrong," he said. "Anybody who knows anything can see that this elephant is like a snake." The fourth reached out his arms, and grasped one of the elephant's legs. "Oh, how blind you are!" he said. "It is very plain to me that he is round and tall like a tree." The fifth was a very tall man, and he chanced to take hold of the elephant's ear. "The blindest man ought to know that this beast is not like any of the things that you name," he said. "He is exactly like a huge fan." The sixth was very blind indeed, and it was some time before he could find the elephant at all. At last he seized the animal's tail. "O foolish fellows!" he cried. "You surely have lost your senses. This elephant is not like a wall, or a spear, or a snake, or a tree; neither is he like a fan. But any man with a par-ti-cle of sense can see that he is exactly like a rope." Then the elephant moved on, and the six blind men sat by the roadside all day, and quarreled about him. Each believed that he knew just how the animal looked; and each called the others hard names because they did not agree with him. People who have eyes sometimes act as foolishly. Add The Blind Men and the Elephant to your own personal library.